Pamela Livingston–What Was on Her . . .
A blog about the writers and illustrators of children's and young adult literature. Here, we get to the heart of their work and lives by asking What Was on Their . . . minds, desks, play lists, refrigerators, and more. Sandra Nickel writes books and poetry for young readers. Sandra has two forthcoming picture books with Abrams Books for Young Readers and one with Lee & Low Books. Her poetry can be found in SCOOP magazine. Sandra holds an MFA from Vermont College of Fine Arts and has presented workshops on writing for children and young adults throughout Europe and the United States. Sandra is the winner of Hunger Mountain‘s Katherine Paterson Prize for picture books for two years running. 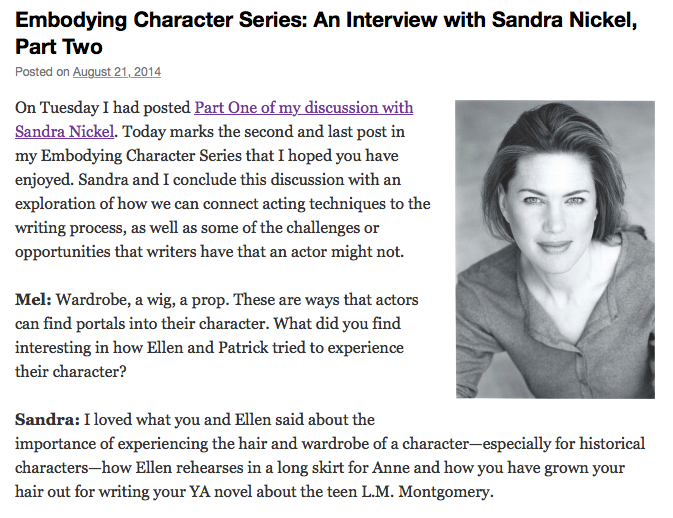 Sandra is represented by Victoria Wells Arms of the Wells Arms Literary Agency. I am thrilled to announce that I won the Katherine Paterson Prize for Picture Books for the second year in a row. ‘The Sun Has a Secret,’ my poem about the sun falling for the moon, is in SCOOP’s 1st anniversary issue. If you haven’t yet picked up an issue of SCOOP, do. It’s a brilliant children’s magazine that counts among its contributors Neil Gaiman, Sir Tom Stoppard, Herbie Brennan, and Jacqueline Wilson. THE PARIS REVIEW . . . The Paris Review celebrated James Fenimore Cooper’s birthday by picking up and republishing portions of my April 30, 2014 blog–The Voracious Child Readers of Russia. 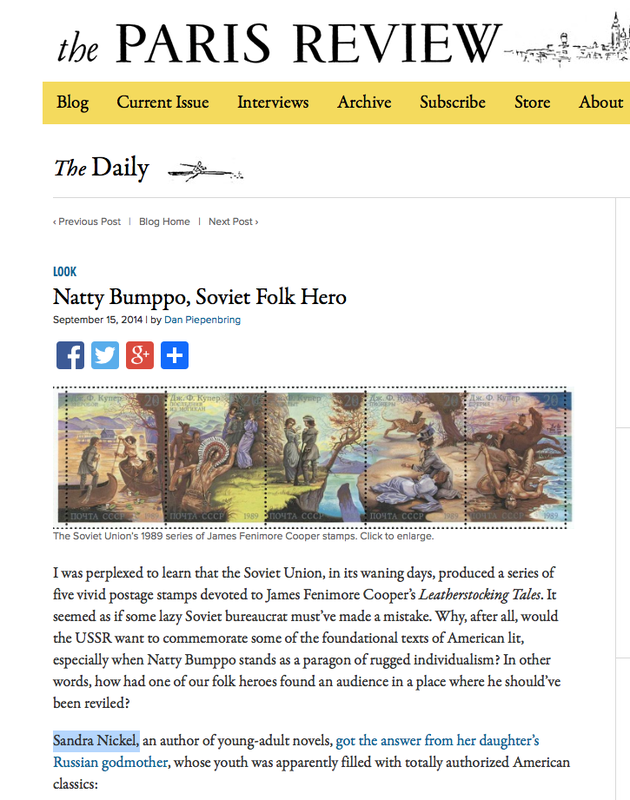 If you would like to read the Paris Review’s Natty Bumppo, Soviet Folk Hero (September 15, 2014), click below. Melanie Fishbane invited me to join her series on Embodying Character, where she interviews the actors of Anne & Gilbert, a musical adapted from L.M. Montgomery’s Anne of Avonlea and Anne of the Island, all toward the end of investigating the overlaps between writing and acting. Before taking up writing, I studied acting for three years in New York City. If you were a fan of New York’s acting scene, you might have caught me in some very dark, very serious off-off-Broadway showcases and as a nurse on The City or serving up coffee as ‘Sandy’ on As the World Turns. So, as you can imagine, I’m endlessly fascinated by the similarities between writing and acting and was thrilled to participate in Mel’s series. Hillary Homzie–What Was on Her . . .
Mina Witteman–What Was on Her . . .
Nora Carpenter–What Was on Her . . .
Miriam McNamara–What Was on Her . . .
Mary Winn Heider–What Was on Her . . .